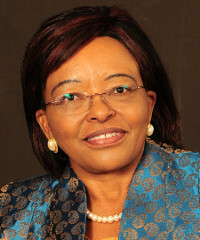 Dr Betty Gikonyo is the co-founder and CEO of the Karen Hospital, a Nairobi based 102-bed specialty hospital. Established in 2006, the Karen Hospital today has five satellite centres in different parts of Kenya. Recent expansion also includes the establishment of the Karen Hospital School of Nursing. Gikonyo is a consultant paediatric cardiologist and co-founder of the Heart to Heart Foundation, a non-profit medical charity that funds curative services to children with heart ailments and raises awareness about preventing heart diseases in Kenya. Last year, she released her autobiography, The Girl Who Dared to Dream. My first job was working with the Kenya Railways and Harbours just before I joined university. I was a clerk. I was earning KSh. 700 (US$8) which was a lot of money coming from the KSh. 20 ($0.20) I was often given as pocket money while in school. It was so much money I did not know what to do with it. I would say my husband [Dr Dan Gikonyo]. We met before we became doctors and we have walked the same steps together. When we were students at university we read for exams together, we went to internship together… I would say being able to discuss with Dan about medicine, about prospects for post-graduate studies [and] prospects for starting a hospital has had great impact on my career. I would say we have mentored each other. He is a very positive person and he is very encouraging. Dan is one of those men who does not pull you down. He allows you to make mistakes as you progress in your career. He was the cleverest student in class and so nobody would intimidate him. I think Dan is very confident. He is not threatened. He knows that when I shine it doesn’t take away light from him. Different times come with different things to worry about. The financial obligations are what preoccupied me [in the past] but not anymore because we have paid off our KSh.700m debt ($8m). For me the financials: the payroll, the suppliers and the bank debt… kept me awake not in a bad way but because I am alert to the great responsibility that was weighing down on my shoulders. In as much as I work with Dan, we have separated our responsibilities. He takes care of the clinical issues and I make sure that the business side is working. If I had a choice I would prefer to be on the clinical side because I am a doctor and that is my comfort zone. I am a perfectionist in some way and I don’t like things not going right. I want suppliers and staff paid on time. When you run a hospital you never run out of people who need your services but sometimes your clients do not have money. I work hard and I am persistent. When I want something I go for it. I will not stop until I get it. I don’t necessarily step on people’s toes, but when I see an obstacle I look for ways to overcome it rather than turning back. I have that resilience and tenacity. I am not being arrogant but I really believe in myself. I believe I can succeed and that when I take up a responsibility I can do it. I am also good at convincing people to come on board and join me in executing an idea or supporting my cause. God has given us a very beautiful country that has literally everything that a human being could want.Kenya is the Garden of Eden. We have a sea, we have a desert, we have mountains and hills, we have the Rift Valley, we have wildlife and a wonderful climate. Kenyans are very good people. When you get them to come together they are able to move even a mountain. I appreciate the colonialists [because today] we have a highly educated population. If you want heart surgeons they are here, if you want great bankers and IT innovators they are here. Kenya is a country that is endowed with so much human resource. I think corruption. We have grown it and it has permeated the society in such a bad way. I have this theory: from a scientist’s perspective, I think corruption is a mutant gene. When people are born they are born with it. Corruption starts right from the house when for a child to clean his own room he has to be paid. It sounds so simplistic but that is where it starts. From a very young age people start to demand what is not theirs, they start to expect payment for work they have not done and try to live a life out of money they have not earned. We as parents need to start arresting that from a very early age. We should go back to earlier teachings from church and school that by your sweat and your blood you shall eat. No more, no less. I am actually easing off in terms of day-to-day management of the hospital. I have a very good succession plan. My deputy is in place and all things working out by June, I should be able to say there is someone who is running the show here. I want to develop the school programme. I want to leave a legacy of training the next generation of medical doctors. I feel the expansion of the hospital and satellite clinics can be handled by someone else as I focus more on medical training in a bigger way… like a university. I like travelling to my rural home. In my younger days I really loved gardening. I am a hands-on person. I also enjoy family gatherings. Our chairman always says you can “work rested” such that when other people think being at work at 9pm is stressful, you can work long hours because you love your job. First and foremost, make sure that you get the knowledge and skills in the area that you are interested in. I would say that already exists among many youth. What should be addressed is how they can now go into business. One way they can do this is coming up with a project in a field they have a passion for. That passion is very important as a driving force so the first thing should be identifying where your passion is. History is important. We need to look at what has made other countries fully develop. Countries that have done really well are strong in manufacturing. We can never grow if all that we sell is manufactured elsewhere. At Karen Hospital we consume a lot of medicine, gloves… they need to be manufactured here. After all, we have the raw materials. The efforts to support young entrepreneurs should not be to encourage them to import more mitumba (second hand clothes) and bring in more Chinese goods. This value addition that is much talked about now needs to be actualised. I see Africa’s future growth in the continent’s ability to manufacture. We should also believe in ourselves. [We should] believe that an African-made basket is good… then we will start to consume our own. The whole world is a consumer society, however, Africa consumes from outside a lot. I know we can’t be fully self-sufficient but we really need to believe in ‘made in Africa’. We should not assume that ‘made in Africa’ is poor quality. I am not saying that we should accept mediocrity. We should know that businesses have a learning curve and if we don’t give local entrepreneurs a chance, try out their product, critique them and give comments, how will they improve? We should be supportive of our own African initiatives. Africans should not be fighting each other. I am an optimist. I don’t think this is a mutant gene. We can deliberately decide that we want to support each other and accomplish that.